I don’t know about you, but any recipe that requires dough to be rolled out raises a great big mafan flag for me. For one thing, I don’t have a lot of counter space in my kitchen. For another, I am naturally gifted at making a mess in the kitchen, and rolling out dough guarantees I will get flour everywhere. Plus, I am simply bad at rolling out dough. I end up with squarish tortillas and warped pie crust. Sigh. So, for all those reasons, if I ever find a way to skip rolling out dough, I grab it. And here in China, there happens to be something available to help counter spatially-, cleanliness- and rolling-ability-challenged cooks like myself: 饺子皮 jiaozi wrappers! They’re basically like little pre-made, pre-cut circles of dough. Obviously, they won’t taste the same as making the real deal, but they’re a decent local substitute and time-saver. They are nice and convenient, readily available anywhere in China, and very cheap. Since they’re small, it means any of these recipes can be used for appetizers. You’ll be ready for a party! Or for when Cher comes over! Prepare your filling. You want to make sure all the ingredients are chopped fine and thoroughly mixed for the best results. I almost always cook my filling first for these recipe hacks (though not when I’m making real Chinese jiaozi). Dip your finger in water and trace around the edge of a wrapper to moisten it. This will help it stick to itself in step 4. Place a small amount of filling in the middle. As you stuff a few, you’ll get a good sense of how much is too much or too little. Pinch, fold, or press the edges to make sure they are completely sealed and no filling is squooshing out. Using a fork to press down the edges is easy and makes a nice decorative edge. Your Chinese friends or the Internet can show you fork-free ways to do this. Alright, friends, on to the hacks! Empanadas come in oodles of different fillings, including sweet fruit ones. You can choose any filling that suits your fancy. Filling suggestion using only local ingredients: ground pork, onion, tomato, jalepeños, and cilantro, seasoned with salt, black pepper and cumin. For samosas, follow the same method as empanadas, but with a samosa filling, or at least something with Indian flavors. I recommend brushing the tops with oil because it’s nice to have a crispy crust for these. Filling suggestion using only local ingredients: potatoes, onions and peas, seasoned with salt and curry powder. Continuing on our trip around the world, let’s stop by the U.K. to give these popular snacks a Chinese makeover. Use the same method as empanadas and samosas, but brush the tops with an egg wash (1 egg beaten lightly, add about 1Tbsp milk or water). Filling suggestion using only local ingredients: diced beef, potatoes, onion, seasoned with salt and black pepper. Trekking on to Italy, but this time, let me give you a little variation on the stuffing method. 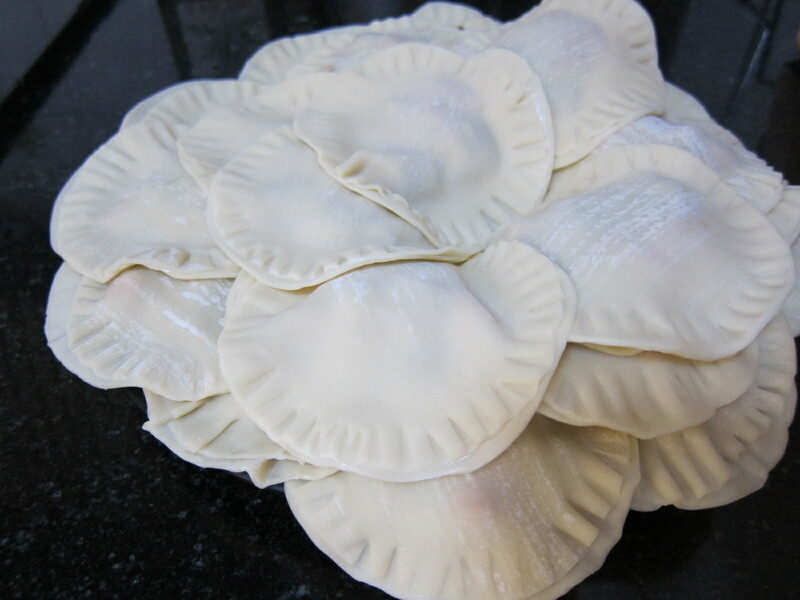 For ravioli, rather than putting filling into one jiaozi wrapper, you’re going to use two. Put the filling in the middle of the first jiaozi wrapper, a little more than you would for the previous recipes, then cover it with a second. Press around the circle with a fork, and voila (or whatever you say in Italian for ‘voila’), you’ve got a ravioli (or whatever you say in Italian for the singular form of ‘ravioli’). Boil the ravioli rather than baking them, then top them with your favorite pasta sauce. Filling suggestion using only local ingredients: eggplant and red pepper, seasoned with chopped garlic and salt. Move over, Mrs. T’s! Make these using the ravioli method. My favorite way to eat these is how I remember eating them in Ukraine – boil them, drain them, then top them with sauteed onions, chopped fresh dill, and a dollop of sour cream. Смачно! Filling suggestion using only local ingredients: mashed potatoes made with salt and milk, chopped sauteed onions. Time for another little twist to our method. This one is the most labor intensive, and I think if my family wants pot pie again, I may just do the real thing. However, these would be very cute at a party, wouldn’t they? 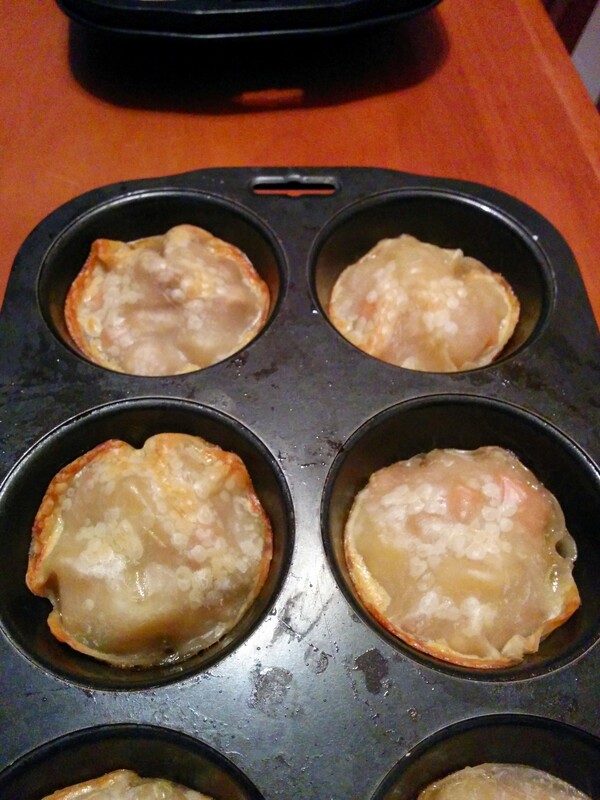 Grease a muffin tin. 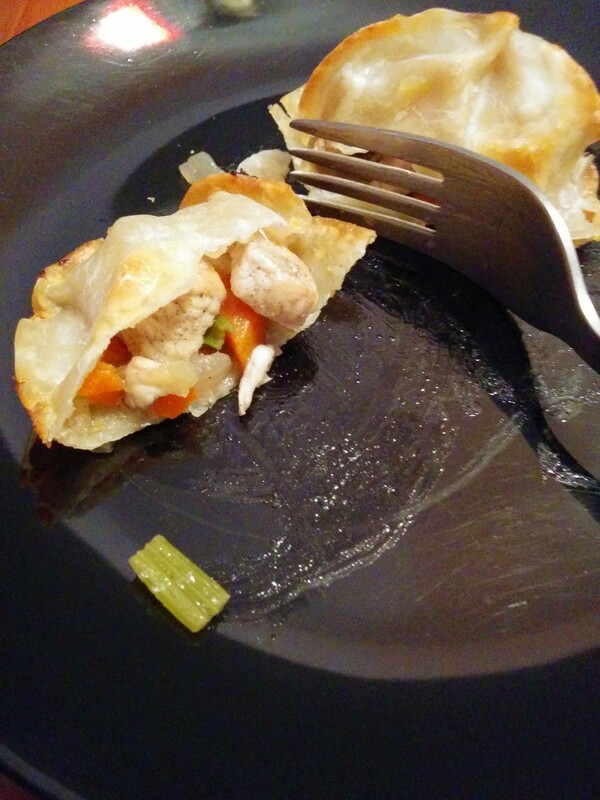 Line the bottom of each up with a jiaozi wrapper, then fill ¾ full with pot pie filling. Wet the edge of a second jiaozi wrapper (as in basic directions), and lay it over the top of the filling. Carefully press its edge onto the edge of the bottom wrapper to seal them to each other. Brush with egg wash. With a sharp knife, cut 1-2 small slits in the top of each pie to vent. Bake at around 200C for about 15 minutes. Filling suggestion using only local ingredients: chicken, celery, potatoes, carrots, onions, seasoned with black pepper and salt, thickened with cornstarch. Pita chips are not a meal in and of themselves (someone out there *puts down bag of Stacy’s and looks around guiltily*) but they make for a great accompaniment for things like babaghanoush and hummus. 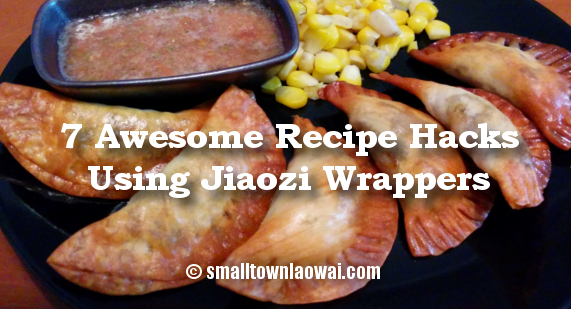 Arrange jiaozi wrappers in a single layer on a greased baking sheet, bake at for about 20 minutes. You really need to watch them at the end; they can burn quickly. After removing from the oven, sprinkle with salt. You can also brush them with oil and sprinkle with salt before baking, but I’m lazy. These puppies are very versatile. They can go with just about any dip, because, hey, you are in China. You can also call them tortilla chips (chabuduo lah!) and serve them with salsa. You can sprinkle them with other seasonings if you’ve got them. Go crazy. I’ve even sprinkled them with cinnamon-sugar instead of salt to make chabuduo lah sopaipillas. Update: There are now 7 more ideas to try out! Let me know what you think, and keep those creative ideas coming. My favorite things to do with them is use them for lasagna noodles (or use chun juan pi). No boiling beforehand!! Just do it like your regular recipe. I do add a bit more water to the sauce or pour 1/2 cup around the edge before I cover and put in the oven! Uncover for last 15 min. YUM! I also make garlic chips when I’m looking for something crunchy! Thanks, Marcia! We will have to try out your lasagna idea, too. Hun hao snd good thinking! I rolled my own once till I caved and bought the pre-made. They take a long time to mske and go down in seconds! Thanks! I hope those pita chips prove to be very useful. chunks of banana, chocolate chips, twist up like a Hershey Kiss shape and bake with egg wash. Sprinkle powdered sugar once cooled. Pistachios chopped, dried fruit (plumes and raisins are easily found at local markets), bake after butter coated and drizzle with honey while still warm. Baklava copy copy. Thank you so much for these recipes! I never even thought to use them in an unconventional way…. I wonder what my Chinese friends will say…. You are welcome, Alisha! 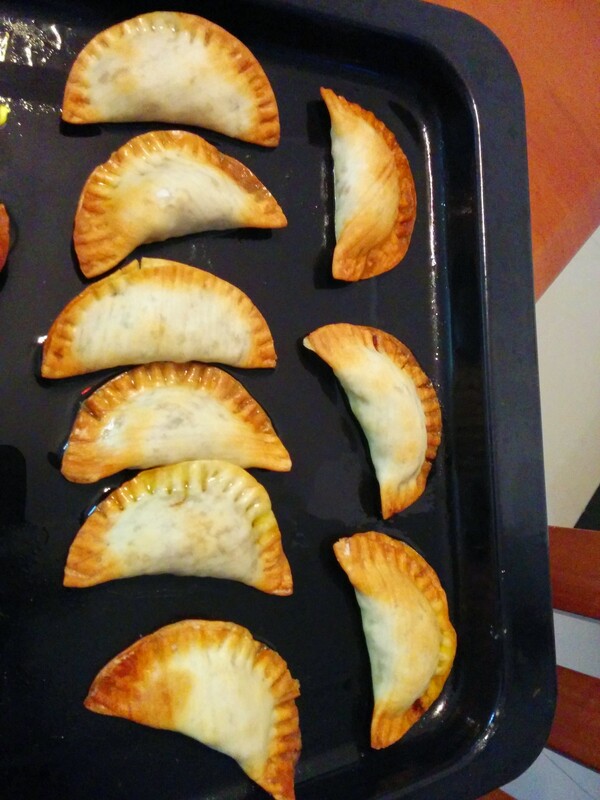 Not long ago, I had a Chinese friend try the empanadas. I think she was a little weirded out by the crunchiness, but she thought the flavor was good. Let us know what your Chinese friends think! Yes, please do let us know what else you try! Emily I love your humor. Because I do like making “dough-like” things myself I haven’t really gotten into the 饺子皮substitutions. But I love your ideas and now that we don’t have kids at home and eat less/make less, these ideas sound amazing and relatively simple. Definitely going to try some of them. Thanks! Thanks, Martha! I hope you find some that you like, and that are good for your empty nest. I think the pita chips and empanadas are our favorites from this list. I’ve been making mung bean hummus lately and the pita chips were a perfect fit! I think even some long-term laowai were surprised by the ingenuity of it. Talk about “Snacking with Chinese Characteristics”… I’ll definitely be trying some of your other ideas! Wow! My husband loves them when we mix shredded mozzarella cheese with some spaghetti sauce as a filling and then deep fry them, or chopped apple and cinnamon, but I never thought of baking them, or using them as lasagna or ravioli. This is awesome! Thanks! And I’ve never thought of deep-frying them! I’m sure that makes them delicious, especially with the fillings you mentioned. Thanks for the great ideas, and enjoy trying out some of the ones from this post! We deep fry them and use them as corn chip substitutes for taco salad. The jiaozi wrappers work well for dipping because they are thicker but the huntun/wanton/chaoshou wrappers are lighter and crunch up easier. I’ve also filled them with refried beans and fried them as a fun side. I’m excited to try baking them! I’ve never fried them before, so I may have to try that, Beth. Happy cooking!